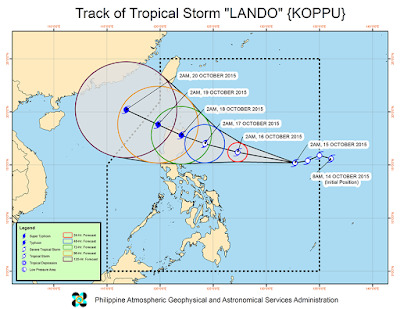 PAGASA advised to the public today, October 15, 2015, that Tropical Storm Lando is still moving toward northern Luzon. No public storm warning signals have been raised so far. As of 11:00 A.M., "Tropical Storm “LANDO” was estimated based on all available data at 1055 km East of Baler, Aurora (15.4°N, 131.4°E)." According to PAGASA, Bagyong Lando has maximum sustained winds of 75 kph near the center and gustiness of up to 90 kph. And the estimated rainfall amount is from moderate to heavy within the 500 km diameter of the tropical storm. However, PAGASA is expecting the storm to intensify into a severe tropical storm until Saturday and further develop into a typhoon before making landfall on Sunday early morning. For the meantime, the next weather bulletin will be issued at 5 P.M. today. Comments or suggestions about "Bagyong Lando toward northern Luzon - October 15, 2015" is important to us, you may share it by using the comment box below.